System was a collaboration between Angela Ferraiolo, Greg Nemes, and myself built for the grand opening of Brown University's Granoff Center for the Creative Arts in January of 2011. Described by Greg as a "convoluted communication interface", System was built in response to the premise of the Granoff building itself, whose unique architecture is suggestive of a utopian paradise for artists but is ultimately complicated by challenges of privileged access and its status as a capital asset. 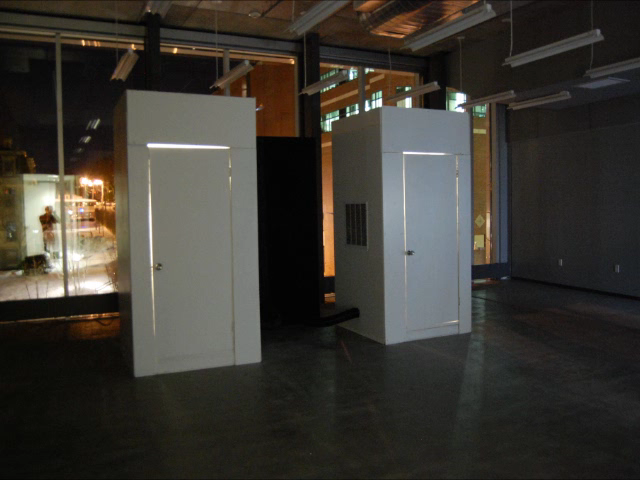 System is comprised of two fully-fabricated white booths, lit from the inside, and a black monolith that is situated behind. Corrugated plastic tubing runs from each booth to the monolith, suggesting the that the electronic brain of the system is situated invisibly within a literal black box. 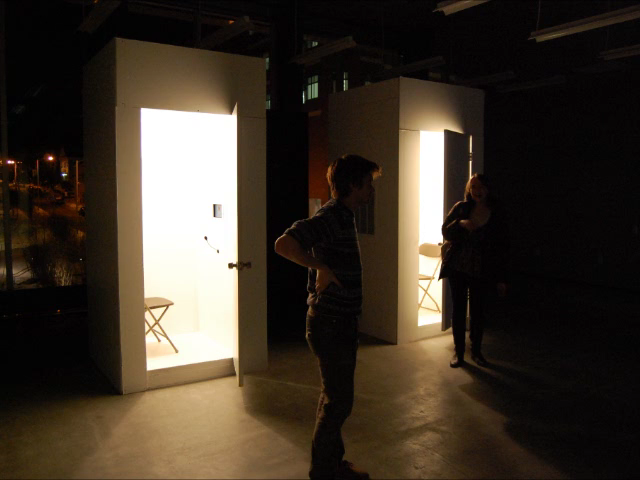 Inside the booths, viewers are presented with a chair, a small CCTV screen with a microphone protruding below, and a lightbulb, speaker, and hidden camera in each ceiling. 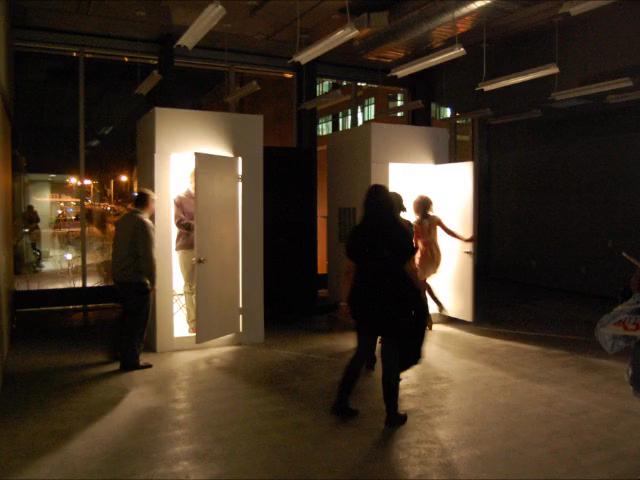 System presents viewers with various permutations of video/audio feeds from their own booth and the opposite identical booth, convoluting what could easily have been constructed as an "egalitarian" communication system by introducing a permanent element of uncertainty; a viewer is never certain if they are being viewed as they view, if they are being heard as they hear. Timelapse footage courtesy of Greg Nemes. While largely a collaborative effort, my unique contribution to System was building the technical system itself. Using Max/MSP/Jitter, I developed a routable matrix of audio and visual feeds that allowed the audio/video to be dynamically sourced and delivered to either of the booths in real time. Further, I developed effects processing to give the audio/video a grainy CCTV quality, including text overlays on the screens that provided seemingly pertinent information that was actually quite useless.